Dan "Daddy Squeeze" Newton, Connie Evingson, and Irv Williams all have new CDs and they're all having CD release events this month. Good news for local music and worth writing about for MinnPost. My column is short and so was my time so I interviewed just one of the three, Daddy Squeeze, who celebrates the release of Hi-Top Sneakers at the Varsity tonight. I asked him, "When did you start playing accordion? Did you choose it or did your parents make you play?" Dan: I started on piano. I was "self-taught" or learned by ear. I also played some guitar, dulcimer, harmonica, recorder, mandolin, ukulele, and other odd instruments. In 1978 I was playing piano in a country band in my home town of Lincoln, NE. We got booked in a bunch of bars that didn't have pianos. I was complaining to a friend that I wouldn't be able to do the gigs. She said she had an instrument with piano-shaped keys in her attic that her uncle used to play. 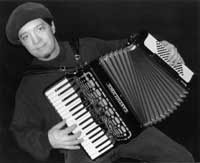 I brought it to the band's next rehearsal and the leader, who had just returned from a trip to Texas and Louisiana, said if I was going to play accordion we had to learn some Cajun, Zydeco and Tex-Mex tunes. It got quite a reaction from the hippies and cowboys that hung out in the Nebraska clubs back then. By 1987 I was living in the Twin Cities, playing only accordion. Photo of Dan Newton from his Web site.